Still from an investigation into the Polish railway system broadcast by the Uwaga programme on the TVN television channel in Poland last week. Bearing in mind we are in the 21st century, rail travel should be a bit different. Don’t you think? Sometimes during the rush hour only one train set appears. Then it’s like those old war films, you have to push to jam all the people in. Everybody then forgets about being a gentleman and just throws themselves into the train like an animal in order to grab a seat. The Polish railway landscape looks awful. We have to admit that in no other EU country does the railway station infrastructure look so bad. There are no good examples of railway station developments. What about Dworzec Centralny in Warsaw? Well the standard of the kebabs served there is hardly appropriate to such a prestigious location. Why do Polish railway stations frighten away passengers… with their appearance…with their smell. Because here, it’s not a nice smell. The station where we are at present, Dworzec Centralny, is not in a good state. We intend to renovate it. But this is a station where quite a lot has changed. This is a station which is cleaned 24 hours a day. This is a station which has security guards. This is a station where, if you look around, you won’t find pathological suspicious characters. Because such people are asked to leave. According to a report published by NIK, the government audit office: 40% of railway stations do not have functioning toilets, Only 50 stations (5%) meet some criteria for disabled passengers, and 0% meet all criteria, What sort of advertisement is that for Polish State Railways? That, of course, is not satisfactory. But you should remember that there are stations with such a low usage by people that operating a toilet, for example, by a third party who rents the facility from PKP, because that’s what we normally do, would not be economic. I want to go from Aleksander Kujawski to Katowice. There is no information anywhere. It’s a scandal. There used to be a big information board here with details of the connections in all directions. (POINTS WITH HAND.) Why can’t this information still be displayed? They’ve closed the ticket office because it’s supposedly uneconomic. I would like to find out the time of the train to Gdansk. What time do I have to be here in the morning? What is the time of the train to Aleksandrow? You would have to leave here at 07:33 arriving at Aleksandrow at 07:44. And then you need the 08:26 pospieszny from Aleksandrow. Yes. Good. Does anyone else want anything? Does anybody else want a standard ticket to Aleksandrow? Do you sell tickets for longer journeys, or just to Aleksandrow? I do if the destination lies on the route of a local train. No they’re now run by the InterCity company. You would need to buy a ticket from the ticket office at Aleksandrow. Pasengers on these trains are usually the elderly or passengers with luggage. Where is the customer care? Who is looking after their interests? The economic factor is often a factor which cannot be avoided. Because 80% of the tickets sold at Chichocinek were tickets for another operator, that is the InterCity company. We only received a small margin. The whole business plan of that ticket office collapsed when those trains stopped being our trains. Still from TVN’s Polskie koleje cz. 2. We bought train tickets in Gdansk for a journey from Gdansk to Jaroslaw and return. To Jaroslaw we took a poszpieszny (semi-fast) train to Warszawa from Gdansk. In Warszawa we changed to an ekspres (fast) train to Cracow. From Cracow we took a pospieszny train to Jaroslaw. In Warszawa we discovered that our train was running 40 min late and that we had only a couple of minutes to change onto the Ekspres train to Cracow. The worst leg of the journey was Cracow to Gdansk. The train was packed like a sardine tin. There was nowhere to sit or stand even we immediately wanted to get out. we rang all our family and friends with Internet access to ask whether their might be an alternative route via Katowice, but they couldn’t find a connecting train. Couldn’t you have asked the guard or his assistant? It was impossible to get to them. I’ve no idea where they were. How’s that possible? I don’t understand. Was it that crowded? It was very crowded. There really was no way to walk through the train. Passengers had difficulties in getting off the train at their destination stations. Can you tell me where I am to sit down if I have this ticket? According to the note, if you find a free seat, you are free to use it; if you don’t, you are free to travel standing. As there aren’t enough seats, why don’t you attach more coaches? Well, there is a technical problem. What, the locomotive couldn’t haul more coaches? It might be able to haul them, but the length and mass of the train. A certain mass is calculated for each route. What! Am I to travel for 5 hours standing in InterCity? It would be best if Sir got in and looked for a seat. OK? What! No places in the restaurant car? Was it so difficult to inform passengers that the train would be so badly delayed. But Sir, we didn’t know either. You have no telephone communication. We do have telephone communication. But no one is going to tell us how long we are going to stop here. Do you like being late? No, I don’t like being late. What do you think of those who are late? Why are your trains so frequently late? All these late running trains, not always… It’s not always the fault of PKP InterCity. Of course the passenger is not interested whenever the track is being repaired, or the train has caught up with another train, say a goods train. Of course, everybody blames InterCity. Why don’t you now reduce your fares on routes which are being rebuilt and where the journey takes substantially longer? Our track access charges are the same. For example we had a problem and wanted to rent some rolling stock from PKP. They weren’t willing to rent the rolling stock to us in spite of the fact that there is a lot of spare rolling stock which is underutilised. So it was possible. In addition the margins that they wanted to charge us for selling our tickets were without precedent anywhere in the world. There were problems in getting the arrival of our trains announced at stations. There were problems in fuelling our trains. The charges that were proposed would have meant it would have been cheaper for our trains to fill up at the local petrol station. It was a joke! Still from TVN’s Polskie koleje cz. 3. Unfortunately these are the factors that make people choose road transport. There were times when driving 30 km took us 2 hours. My wife and I have lost faith in Koleje Mazowieckie. We were never sure whether the train would arrive on time. Sometimes the train never came. There was no announcement. Or whether we would be able to sit in the train, because the train would only have one unit. Unfortunately the railway is not really a player in the urban transport market. I’d like to remind you that in France 90% of railway journeys take place around Paris and other large conurbations. That’s the basic market for rail passenger transport. How much do your car journeys from outside Warsaw cost you? I can’t understand why you switched to your car, if it’s less comfortable and you have to pay more. I was late dozens of times because of the train. My boss wasn’t very impressed. One can’t continually turn up late at work. It’s not pleasant. Everything was neat and tidy and in its place. And the train, even though it was was pulled by a steam engine, did shift along at 100km/hr. What was the pride of the railway? What was the pride of the railway? The punctual management of trains. punctuality. If I didn’t have a good reason for being late I was punished. My wages were docked. Did the job of a railwayman carry social status? Yes. The people alongside who I took my first steps were drivers and railway men who had started their careers before WWI. They were gentlemen. They taught me to respect people and work. Sadness. It hurts to look. When you see destruction. the break up of everything that we built up with such hard work, it really hurts. The Kujawy Narrow Gauge Railways at their zenith had some 1,500 of track of various gauges. Here in a guest article ‘Inżynier’ tells the story of their genesis in Poland’s Prussian and Russian partitons, through their role in a post-1918 newly-independent Poland until the outbreak of WWII. The Kujawy narrow gauge railwys just before WWII. Map ©Bogdan Pokropinski. As regular readers of BTWT will know, the Krosniewice railway closed to regular traffic last year. As well as the passenger traffic, which finally ceased at the end of March 2008, SKPL, had also been carrying freight to and from the sugar factory at Brzesc Kujawski until shortly before the closure. The Krosniewice railway was the eastern end of the extensive Kujawy network, at the western end of which is the Gniezno railway. Regular passenger services on the Gniezno line ended back in the 1980s but freight traffic continued and, when PKP ceased narrow gauge operations at the end of 2001, the local authority took over the railway and, as well as ‘tourist’ passenger trains, continued to carry freight – until about August 2008. Thus, in the last year or so, we have seen the end of regular passenger services on the Kujawy network, the end of freight traffic on the Kujawy network and the end of the last sugar factory in Poland to be served by narrow gauge railway – although Brzesc had stopped receiving sugar beet by rail in the late 1980s, it had continued to operate a short section of its internal railway, from the coal stockpile to the boiler house, even during the ‘gap’ period in 2002 between the end of PKP’s narrow gauge operations and SKPL starting to serve the factory (during which time, presumably, coal and limestone were supplied to the factory and sugar taken away by road lorry), but the factory has now ceased production. With the effective end of the Kujawy network as a common carrier railway it is appropriate to look at how such a network came to exist since its history, whilst unique amongst narrow gauge railways, is in essence the history of the whole of the Polish railway network and, indeed, the present Polish state. In the nineteenth century Kujawy was divided between Prussia and Russia – there was no Polish state as such, although the name was often used to describe the Russian ‘Congress Kingdom’ of Poland (so named because Russian sovereignty over the region was a result of the Congress of Vienna) although it was ruled by the Tsar. The briefest of glances at a railway map of Poland (particularly a map of the railway network at the outbreak of the First World War) will show that there were far more railways in the zone of Prussian control, and so it was that the first narrow gauge railways in Kujawy were in the west and north, forming part of Prussia. The first line was built by Pakosc (current Polish place names are used throughout this article, although in many cases there were slightly or significantly different Prussian names at the time) sugar factory in 1880, a 900mm gauge line initially worked by horses. In the following year Kruszwica and Wierzchoslawice sugar factories opened their first sections of railway; the Wierzchoslawice line was, like that of Pakosc, engineered by Julius Erxleban from Berlin and was 900mm gauge, while the Kruszwica line was built by Krauss to the unusual gauge of 716mm. In the 1890s, these lines were joined by those of Tuczno (900mm) and Matwy (750mm) factories. Meanwhile, over to the west, a sugar factory was built at Gniezno and its railway of 900mm gauge opened in 1883. After the Prussian ‘law of minor railways’ was passed in 1892, the district authority of Witkowo decided to acquire the Gniezno sugar factory railway and adapt it for public use. Also in the 1890s, the district of Wrzesnia decided to construct a narrow gauge railway to develop the more remote parts of the district. While the Prussian authorities permitted relatively short ‘industrial’ railways to be built to various gauges, when it came to public railways that were close to the border with Russia, military requirements had to be taken into account. Presumably, such requirements were the reason for the conversion of the Gniezno sugar factory railway to 600mm gauge under the control of the district authority; this was the gauge chosen by the Prussian army for its military field railways, so they could easily extend lines of this gauge into enemy territory in the event of war. Indeed, by the outbreak of the First World War the Witkowo district railway had been extended to reach Anastazewo on the border with Russia, and a number of other branches were being built. In the part of Kujawy controlled by the Russians sugar factories developed somewhat later, with the first sugar factory railway being that of Brzesc, opened in 1900. Dobre sugar factory’s line opened in 1908, followed by Ostrowy in 1910 and Goslawice in about 1912. Whereas Brzesc, Dobre and Ostrowy all had connections to the main line railway to the east, Goslawice was close to the border with Prussia and, although its railway had to be 750mm gauge (like all of those in the Russian-controlled area, for that was the gauge used by the Russian military), its nearest railway was the Witkowo district railway at Anastazewo, which was 600mm gauge. Thus, all supplies to Goslawice (including the locomotives to operate the railway) had to be delivered by standard gauge train to Gniezno, be transhipped to 600mm gauge wagons for the journey to Anastazewo, then be transhipped again to 750mm gauge to reach the factory. Another sugar factory in the Russian controlled area, at Chocen, also developed a short 750mm gauge railway, worked by horses. So, by the outbreak of the First World War in 1914 there were quite a few narrow gauge railways in the Kujawy region. In the west were the 600mm gauge systems of the Witkowo and Wrzesnia district railways, connected together with a total track length of over 100km and interchanging with the 750mm gauge Goslawice sugar factory line with 48km of track. In the north were the 900mm gauge railways of Pakosc, Wierzchoslawice and Tuczno sugar factories, already linked to each other with a total of 147km of track, south of them the 45km of the Matwy 750mm gauge line and close to that the 130km of 716mm gauge railway serving Kruszwica sugar factory. To the east were the sugar factory railways of Dobre, Brzesc, Ostrowy and Chocen, all 750mm gauge but isolated from each other, totalling over 130km. In August 1914 the Prussian army advanced rapidly through Kujawy and the damage sustained by the sugar factory railways depended on their distance from the former border; Goslawice, being close to the border, survived almost intact but the Russians had sufficient time to evacuate locomotives and some rolling stock from the Dobre and Brzesc systems, all the stock from Ostrowy and the entire railway, including track, from Chocen. A Russian counter-attack led to a Prussian withdrawal and even Goslawice was briefly abandoned by the Prussians but they soon advanced again. The subsequent ‘race of the gauges’ as the Prussians advanced has been fairly well documented elsewhere – as well as reconstructing the damaged Torun-Skierniewice main line, the Prussian military built a number of narrow gauge lines. The Matwy sugar factory line was extended by a 600mm gauge railway to reach the Dobre sugar factory line at Dobre, which was converted to 600mm gauge as far as its terminus at Plowce, from where new 600mm gauge construction resumed to Jerzmanowo on the Brzesc sugar factory’s railway, thus allowing supply of troops as far as Nieszawa and Wloclawek. In November 1914 a further Russian withdrawal allowed a third rail to be added within the Brzesc factory’s 750mm track so that 600mm gauge rolling stock could reach the southern terminus of that railway at Boniewo, from which point new construction on 600mm gauge recommenced in the direction of Krosniewice. That goal was reached in mid-December and the Ostrowy sugar factory’s track was then converted to 600mm gauge to its southern terminus at Koryta, from where further new construction followed through Leczyca and Ozorkow to Strykow at the end of the year. Further north the Wierzchoslawice railway was extended east to reach Przybranowo on the Dobre-Aleksandrow line which, although operated by rolling stock from the Dobre factory, had actually been built by the Russian military. The Kruszwica factory’s 716mm gauge line was extended from its terminus at Jerzyce through Piotrkow Kujawski, Sompolno and Kolo to reach Dabie Kolskie in mid-December. The final railway advance was from Goslawice, where the existing railway was either converted to 600mm or became mixed gauge and a new line was built south through Patnow to Konin – the first railway to reach the town. In 1915 the zone of military action had already moved further east and the newly constructed lines no longer had any military function, but the railways started to serve other needs of the local population and particularly the sugar factories. Thus, in that year a new section of 600mm gauge railway was built south west from Boniewo to Przystronie on the Sompolno-Kolo line and branches were built south west of Krosniewice to Dzierzbice, Krzewata and Opiesin, the latter three enabled Ostrowy sugar factory to bring in sugar beet from a wider area. About the same time, a further section of new railway was built from Wasewo (the terminus of one of Dobre’s lines) to Piotrkow Kuj. on the 716mm gauge line from Kruszwica to Dabie. Even in the west, within the pre-war Prussian borders, there was new construction, because the Witkowo district railway was now supplying a far larger area (including the town of Konin) than it had before the war, and the transhipment facilities at Gniezno were inadequate for the volume of traffic. Therefore, a new branch was built to Czerniejewo, on the Gniezno-Wrzesnia standard gauge line, to create a new interchange station and thus ease the pressure on Gniezno. When the war ended in 1918 a new Polish republic was created, formed from the Russian Kingdom of Poland, the previous Prussian province of Posen and various other regions that had, for the last century or more, been controlled by Russia, Prussia or Austria. Thus, the whole of the Kujawy region was now part of Poland. Local railways such as the Witkowo and Wrzesnia lines remained under local authority control, whilst most privately owned ‘industrial’ railways continued under private ownership, but narrow gauge railways that had been built for military purposes were taken over by the ministry of railways and the newly created Polish State Railway, PKP. In Kujawy, the situation was complex, since many of the military railways included sections that had originally been built by sugar factories, but these now formed part of the state railway. The sugar factories’ needs were addressed by various means, including running powers over the state railway lines, supply of materials to build new lines, financial compensation for losses and convenient terms for construction of new lines, although settlement of such matters continued into the 1930s. Soon after the war, the new ministry of railways drew up plans to upgrade the railway, much of which had been constructed using panel track of the ‘Jubilee’ variety, to make it capable of serving the needs of the region on a long-term basis. The plans envisaged wholesale conversion of the lines to 750mm gauge, but the first action after the war was construction of a new section of 600mm gauge line from Sompolno to Cegielnia on the Goslawice network, which provided the final link to create a narrow gauge network extending from Borzykowo and Gniezno in the west through to Strykow in the south east, Nieszawa, Wloclawek, Aleksandrow and even to Pakosc in the north west. However, whilst much of the system was 600mm gauge, there was a significant section in the north (albeit not under state control) that was 900mm gauge, sections in the north east that were only 750mm gauge, several sections that were dual 600/750mm gauge and, in the middle of the network was the extended Kruszwica line of 716mm gauge – at a very early stage (possibly at the same time as the Sompolno-Ciegielnia link was built) a third rail was laid within the 716mm rails between Sompolno and Przystronie, so that 600mm vehicles could travel across the network from Gniezno to Ostrowy. This was important because Poland had inherited the railway networks of its erstwhile occupiers and those networks had been developed to serve the needs of those empires, so were not suited to the needs of the new nation. For example, the shortest standard gauge route between Poznan and Warszawa was via Torun and, in the Polish-Soviet war of 1919-1921 there was a desperate need to transport horses from the west of the country to the east for the cavalry (such was the situation at the time, that horses were still a key military need – the Polish army still had relatively little mechanised armour at the outbreak of the Second World War). Despite the inconvenience of transhipment, which was no doubt easier with horses, being capable of transhipping themselves, the narrow gauge was thus a key link in the railway network. Another development soon after the war was addition of a third rail, to 600mm gauge, between Jerzmanowo and Brzesc, which allowed the factory at Brzesc to receive beet from areas that were only served by the wartime lines. While most of the wartime lines survived for many years, an early casualty was the Ozorkow-Strykow section, over which civilian traffic was very light; it closed in 1921 or 1922. In 1921 the lack of a standard gauge railway between Poznan and Warszawa was addressed by construction of a new line which cut across the narrow gauge network at three locations. At Konin the narrow gauge railway was cut back slightly from the previous terminus at Czarkow, to a new standard/narrow gauge interchange. At Kolo a flat crossing was created between the narrow gauge to Dabie and the new line and again a new interchange station was built to serve the town, while on the Krosniewice-Ozorkow line a new interchange station was built at Krzewie and a bridge carried the new standard gauge line over the narrow. The first line to be converted to 750mm gauge was Dobre-Boniewo in 1922, followed by Boniewo-Przystronie and then Piotrkow-Sompolno-Przystronie-Kolo-Dabie in 1923. At the same time as the latter change, Kruszwica sugar factory converted the whole of its network to 750mm gauge; an interesting aspect here is that for some time Kruszwica continued to be responsible for the whole of the 716mm gauge section, presumably because it made sense for all of the equipment on that gauge to be housed and maintained in the one depot. This change of gauge was probably the trigger for development of the facilities at Sompolno, which became the main rolling stock workshop for the system, while Krosniewice became the locomotive workshop, with various motive power depots scattered around the network. In the west, the wartime interchange at Czerniejewo became redundant once the standard gauge line opened to serve Konin and Kolo, as Gniezno interchange was now only serving the rural area for which it had originally been intended, thus the link to Czerniejewo closed in 1923. 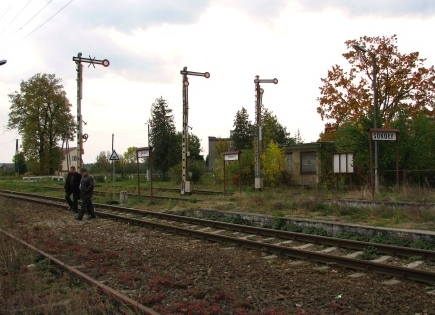 The southern end of the Wrzesnia system had previously been Borzykowo, a village on the border between Prussia and Russia, while the town of Pyzdry a few kilometres to the south had no rail connection. With the former border now having no significance, in the early 30s the railway was extended to Pyzdry and a number of short branches added to the Wrzesnia system. In the mid and late 20s further standard gauge lines were built through parts of the region – that from Kutno to Lodz passed under the narrow gauge Krosniewice-Ozorkow line by a bridge, while the Herby-Gdynia line (built to link the industrial region of Upper Silesia with the new Baltic port) crossed the Przystronie-Boniewo line and the Dobre-Sompolno line as well as the Kruszwica factory network; bridges were built at all such crossing points. In the early 30s a new stylish locomotive depot was built at Krosniewice and station buildings were added here and at other locations across the network. The Krosniewice workshops were enlarged so that they could carry out all locomotive overhauls and Sompolno was developed so that it could construct new rolling stock. By now the central core of the network was 750mm gauge but the former Goslawice network west of Sompolno was still 600mm gauge. Locomotives from that section were transported to Krosniewice over the 750mm gauge sections on special wagons. The last major work carried out on the PKP network prior to the Second World War was construction of a new line to Wloclawek Port, on the Wisla river. Most of the sugar factories had built new lines after the First World War but then the economic crisis began to bite. Pakosc factory closed in 1931 but its railway was taken over by Tuczno. A new sugar factory railway, to 600mm gauge, had been built in the 1920s to serve Lesmierz factory, which was linked to the PKP network at Sierpow on the Krosniewice-Ozorkow line; during the depression Lesmierz took over the railways of the Mlynow factory, some considerable way to the east of the main Kujawy network. The German invasion of September 1939 passed through Kujawy in less than two weeks. The narrow gauge railway network suffered relatively little damage and was back in operation, under DR control, in October. There were some changes to the network during the Second World War, with a number of sugar factory lines being converted from 900mm to 750mm gauge, new 750mm and 600mm gauge lines built to link sugar factory systems and some changes at Gniezno. After the war the common carrier lines were all absorbed into PKP and converted to 750mm gauge so that, with the connected sugar factory systems, there was a network of 750mm gauge railways totalling almost 1500km in extent, and linked to the Lesmierz factory’s system (which largely remained 600mm gauge until final closure in 1986/7). Significant line closures started in the early 1960s and, despite the introduction of transporter wagons and powerful diesel locomotives, both the PKP and sugar factory systems saw a gradual decline over the next 40 years. But that, as they say, is another story. Detailed pre-WWII Polish Military maps published by Wojskowy Instytut Geograficzny, Poland’s equivalent of the UK’s Ordnance Survey, of the areas through which the lines ran are available here. Pyskowice Skansen – Is this the end? Cash crunch and Polish laws driving railway heritage to extinction. Shadows gather over the Pyskowice Skansen, December 2006. You would have thought that someone would have connected the dots by now. In the early 1990s Poland experienced its first cash crunch as an IMF Adjustment Programme, dubbed locally as the ‘Balcerowicz Plan’, eroded the value of the zloty. Poland’s surviving railway heritage was hit badly as PKP responded by getting rid of its regional railway museums, withdrawing passenger services from its narrow gauge lines or closing them down altogether. Fortunately, the Polish railway heritage movement developed to fill the gap. Inspired by the PSMK (The Polish Railway Enthusiasts Association) which was set up in 1987 and took over the roundhouse at Skierniewice, other societies sprang up to save their own narrow gauge lines or preserve standard gauge locomotives and rolling stock. One such society was the Towarzystwo Ochrony Zabytków Kolejnictwa i Organizacji Skansenów w Pyskowicach (The Society for the Preservation of Railway Heritage and the Organisation of Skansens in Pyskowice). Known to its friends as TOZK , the Society led by the brothers Krzystof and Zbyszek Jakubina obtained access to the old roundhouse and carriage depot at Pyskowice. Here they gathered together an impressive collection of locomotives rolling stock, some owned by them and others owned by private owners who wanted to play their part in the Pyskowice project. Today Pyskowice is the home of 27 steam locomotives, 10 diesel locomotives, 8 passenger coaches and 12 freight locomotives. Many of the locomotives have been cosmetically restored and one Slask Tkp class steam locomotive has been restored to working order. In 1999, PKP offered the TOZK the use of old roundhouse at a nominal rental and later suspended this agreement, but from 2002 allowed the Society to use the carriage depot at a peppercorn rent. Now, unfortunately, PKP has changed its tune and is demanding payment of a ‘commercial’ rent. The similarity with the plight of the Railway Museum in Warsaw is quite striking. PKP have now given TOKZ two weeks to clear the site or else to agree to pay a commercial rent back dated since the last agreement expired. Time for another BTWT campaign? Just rub out all the grey lines. Shunting in Smigiel yard, May 2008. Photo BTWT. Robert Hall, who wrote to the Mayor of Smigiel regarding the problems of the Smigiel Railway has received a reply. Robert has already posted this as a comment, but we thought it sufficiently important to republish it as an article. I gratefully accept many European countries’ concern with the future of our local narrow-gauge railway. I want to say that its fate is also important for the local authorities and the inhabitants of Smigiel. That is why I want to deny the rumour concerning the intentions of burdening the current owner, I mean ‘The association of local rail transport’ (SKPL) a special tax. Moreover, I would like to present the legal situation of our narrow-gauge railway. Since April 2009 the Commune of Smigiel has become the owner of the property on which ‘The association of local rail transport’ works, offering its service. As in other European countries, the situation is similar in Poland; the owners of the properties are obliged to pay taxes. This obligation, concerning the property on which narrow-gauge railway was working to the end of March 2009, was supposed to be fulfilled by the Polish National Railway. However, since April 2009, the owner of the land and buildings of the local narrow-gauge railway has become the Commune of Smigiel. In this case, according to Polish law, the owner has got the duty of paying the tax concerning the property, if the act of owning stems from the agreement with the owner. Here, the owning of the property results from the agreement of lending, so the tax, according to the act about taxes and local payments, must be paid by the haulier. I mean, ‘The association of local rail transport’. The mayor of Smigiel is obliged to exact this tax. Moreover, he does not have any legal opportunities to exclude from the tax obligation, as it would be illegal. The owners of ‘The association of local rail transport’ have known that information since April 2009. As I have mentioned, the future of our narrow-gauge railway, taking into account its historical character, is surrounded by special care of the local town council. That is why, in case of a possible resignation of the current haulier, the most important matter will be the maintenance of tourist and passenger transport. Moreover, we do not resign form doing the earlier planned renovation. In this situation, I would like to calm all people, who are worried with the fact that the local narrow-gauge railway may not survive. The first thing to say is that the letter is consistent with what the Council is saying to SKPL – the law requires Smigiel Town Council to levy local taxes. The statement that “Moreover, he does not have any legal opportunities to exclude from the tax obligation, as it would be illegal.” is also exactly what the Town Council are saying to SKPL. One of the solutions that SKPL put to the Council was that each year the Council and SKPL would meet and agree the railway’s budget for the year ahead. SKPL would pay the taxes and the Council would agree to put a similar sum aside for the maintenance of the railway’s infrastructure. But the Council’s interpretation of the law is that this would leave the Council open to a charge of illegally by-passing the tax obligation. Whether this really would be the case remains to be tested. Which brings us to the current situation. SKPL believe that withdrawing the monies demanded by the Council from the railway’s budget in order to pay the local tax demand will lead to a terminal decline of the railway’s infrastructure. Accordingly they have agreed to pay the local tax for the period April – December 2009 and have given the Council notice that they are withdrawing from their operating agreement as from 31 December 2009. They have also said that they are willing to discuss with the council any other solution which may be available to continue passenger and freight services on the railway. The Council are looking at the legal ramifications of operating the railway – but only passenger and tourist services, no freight – themselves. Watch this space. Jozef Zajkowski after checking that nobody was injured in the white van. Inspired by pictures of flaming buses on W-wa Jeziorki, I thought I would have a go at some Dembinski-style photo reportage. Yesterday evening, Jozef Zajkowski, the Wojt (Chief Executive) of Sokoly Council was on his way to Sokoly station on the semi-derelict Lapy – Ostroleka line when he saw a white van coming in the opposite direction trying to overtake a tractor and trailer. Then the van driver saw Zajkowski’s car, chickened out and stood on the break pedal. The van executed a 315° turn and ended up with three wheels in a ditch. Other than injured pride there was no damage to the man or his van. The van driver (wearing light blue jeans) has just asked the tractor driver for a helping hand. Passenger services were suspended on the Lapy – Ostroleka line in the 1990s and freight traffic ceased in 2000. For the last five years, Jozef Zajkowski has been trying to take over the line from PKP. Reinstating the line for freight would help boost the economy in a region of high unemployment. 700 people lost their jobs when the local sugar refinery closed, another 1,200 when the railway rolling stock workshops at Lapy went bankrupt. Several potential customers have declared that they would return to rail transport if the line was reopened for freight. If he manages to take over the railway, Zajkowski also hopes to receive financial help from the provincial governor’s office so that he can run a dmu based passenger service. The last few stragglers arrive at Sokoly Station. Yes that really is a tree growing on the roof of the old station building. Five year’s ago, Zajkowski first approached PKP and told the state railway company that as they were no longer using the line, he would like to acquire it. (In Poland, local authorities can take over redundant railway lines free of charge provided they use them for transport purposes.) He was first told that as the line was of strategic – as opposed to local – importance PKP could not hand it over. After Zajkowski approached many officials and politicians, PKP eventually conceded that it was no longer a strategic line but said that they would still not hand it over. Finally, Zajkowski approached Miroslaw Chaberek when the latter was Undersecretary of State responsible for rail. Chaberek told him that if he really was so sure about having freight customers PKP itself would run the trains. 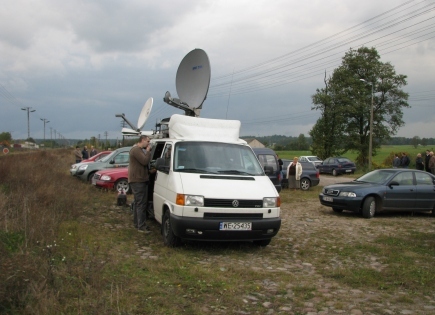 The TVN24 TV crew check their equipment. So, just as the Minister had ordained, about two years ago PKP reopened the Lapy – Sokoly section for freight with some 40 wagons or more making the journey each month. Meanwhile Zajkowski campaigned to take over the rest of the line, finally meeting the current Undersecretary of State responsible for rail, Juliusz Englehardt. Englehardt told him that PKP would divest itself of all of its remaining branch lines and if he wanted the line he was welcome to it. One month ago, Zajkowski formally requested again that PKP transfer the line to Sokoly council. Two weeks later, PKP replied that they would not be handing over the line because of its future freight potential. On 6 October PKP terminated the freight services between Lapy and Sokoly. 20 minutes to go. Some of the 50 local residents who had turned up to support their Wojt. At this point Zajkowski decided that enough is enough and briefed the press. In the last picture, he and 50 local residents wait for the TV24 TV crew to start their interviews. For generations Poles have been wary of their big neighbour, while Russia has for long regarded Poland as a dangerously unreliable and a stepping stone for other nations who have ambitions to raid its lands and national resources. However, the old East vs. West paradigm is dangerously out-of date when it comes to making sense of the new world order. Today, America, China and Russia are battling for control of the world’s natural resources, while the international banking elite determines whether they play chess or Russian roulette. New circumstances demand new analyses and new alliances. Hundreds of thousands of Poles perished in the Russian Gulag and tens of thousand were the victims of the Stalinist repressions. For their families the Russian bear will always be a dangerous neighbour to be kept at arms length. Millions of Poles died resisting the German invader, or perished in the Nazi concentration camps, or were killed fighting alongside the Allies. For their families the sacrifice of their loved ones will always be tainted by a sense of betrayal, when Churchill and Roosevelt handed over half of Poland to Stalin as a gift and consigned half of Europe to the wrong side of the Iron Curtain. In the final analysis neither Russia, nor the West, proved to be a good neighbour to Poland. Given the lessons of history, it seems obvious that Poland should be maintaining good pragmatic relationships with both sides, entering into deals that are of mutual benefit with one neighbour, but doing nothing that would lock-out cooperation with the other. Seen from this perspective, the decision to provide the USA with a bit of Polish territory on an extra-territorial basis ostensibly for a ‘missile shield’ was a dangerous step which gained Poland no benefits and just confirmed Russia’s worst fears about its junior neighbour. Thankfully, the missile shield is no more, no thanks to Polish diplomacy, but the result of a three way deal struck between Israel, the USA and Russia regarding the withholding of long-range missiles that Russia was actually in course of shipping to Iran. A welcome thaw in Polish-Russian relations seemed on the cards when Vladimir Putin accepted an invitation from Polish prime minister Donald Tusk to attend the commemoration of 70th anniversary of the start of WWII in Gdansk. Putin went further than any Russian leader before him in apologising the Russia’s actions in the years leading up to the war. Therefore, one must admit that all the attempts to appease the Nazis undertaken between 1934 and 1939 by striking various agreements and pacts with them are inadmissible from the moral point of view and from the practical, political point of view are senseless, detrimental and dangerous. Therefore, one must admit that all the attempts to appease the Nazis undertaken between 1934 and 1939 by striking various agreements and pacts with them are inadmissible from the moral point of view and from the practical, political point of view are senseless, detrimental and dangerous. In a clear sign that Putin wanted to discuss practical co-operation with the Poles he brought with him his Minister of Transport. But Poles had hoped that President Barack Obama, would attend ceremonies and were upset that the USA had only sent a junior delegation lead by National Security Adviser James Jones. Sadly the opportunity to do ‘business with Putin’ was missed, Polish President Lech Kaczynski, playing to a domestic audience, reminded Putin, On Sept. 17 … Poland received a stab in the back… This blow came from Bolshevik Russia. Given that Kaczynski had decided to use the opportunity to remind the world of some painful history, it is a little strange that he omitted to say that Poland received two more stabs in the back – this time from its allies – at the Tehran Conference in November 1943 and the Yalta Conference in February 1945. In the end the Russian delegation went home without progressing any new Polish-Russian investment projects. Shortly afterwards, the Russian media began to publicise the ongoing project to construct a new broad gauge line from Moscow to Vienna, through the Ukraine and Slovakia. The line would bypass Poland and its own East-West Russian gauge line the LHS. Today is Vladimir Vladimirowicz Putin’s 57th birthday. We would like to use the occasion to wish the president a Happy Birthday! Wielkpolska to go it alone? 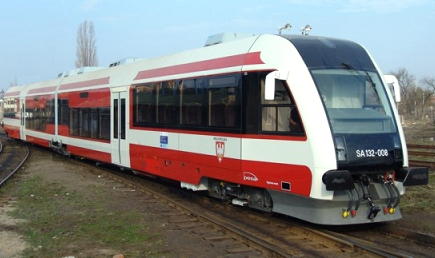 PESA twin coach articulated railbus bought by the Wielkopolska provincial government to operate local services. 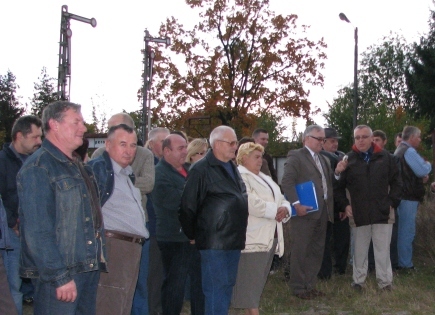 At a meeting of the Wielkopolska regional government on 28 September, councillors voted to break away from the local authority-owned local operator PKP Przewozy Regionalne and to set up their own operating company Koleje Wielkopolskie on similar lines to Koleje Mazowieckie serving Warsaw and the rest of Mazowsze province. The reasons driving the change are financial. Rather than tackle reform of PKP Przewozy Regionalne head on and to reform the company, the government simply ‘gave’ PKP PR to the local authorities. The latter found the gift a poisoned chalice. PKP PR still has a communist-era management team and the company remains a bottomless pit for absorbing subsidies. In 2007, PKP PR received 36 million zloty from the Wielkopolska regional government, for 2010 the company is asking for 82 million zloty. With its expenditure greatly exceeding income, PKP PR’s debts are rising and some commentators have analysed PKP PR’s potential liabilities as being as high as 1.5 billion zloty. In March this year, Infrastructure Minister, Cezary Grabarczyk, announced a government investment package of 3.6 billion zloty upto the end of 2015 – which averages out a 600 million zloty – a year. The package is supposed to allow PKP PR to replace its ageing fleet. So far there is no sign of any new trains coming. Given the scale of PKP PR’s problems it is no wonder that the councillors of Wielkopolska have decided they would be better off running their own railway company. Lxd2-241 resplendent in a new coat of paint in the yard in Smigiel. During the summer Henschel-engined Lxd2-241 underwent a heavy overhaul in Smigiel. In September, it emerged repainted in SKPL’s standard diesel locomotive livery. Newly relaid section of line. Note earthworks on left. The Pinzgauer Lokalbahn is a 53 km long 760mm gauge narrow-gauge railway in the Austrian province of Salzburg. The line connects Zell am Zee on the Salzburg Tiroler Bahn with the town of Krimml. Formerley part of the ÖBB system, the line has now been transferred to the State of Salzburg who have appointed their own regional railway company as the railway’s new operator. In July 2005, the line has suffered major flood damage and many embankments were washed out. The section between Mittersill – Krimml is now being rebuilt and realigned so as to be better able to withstand flood damage in the future. Freight services – consisting of standard gauge box trucks carried on transporter wagons – were suspended by ÖBB in 1998, but were resumed in November 2008. The civil engineering works are being funded by the State of Salzburg and the Austrian Ministry of Transport. If only a similar plan could be adopted for Poland’s narrow gauge railways! Not the Welsh Highland Railway! It was May 1992. I had come to Swanage for a short family holiday and to check out its railways. Swanage actually has two railways. The best known is the Swanage Railway which was built by George Burt and opened in 1885. Since 1972, the line been the subject of a railway project to run heritage trains and to provide a community service linking with the main line at Wareham. Sadly, while the first objective was achieved some 30 years ago, the second, while seemingly tantalisingly close, remains just out of reach. Swanage’s other line is the Swanage Pier tramway, a short narrow gauge line built by Burt’s uncle John Mowlem and opened in 1858. As originally planned, the line would have connected the stone quarries at Langton Matravers to the original pier in Swanage, a distance of some 3 km. A balanced inclined plane, similar to that employed on the Merchant’s Railway in the Isle of Portland, would have been built to overcome the 400 ft height difference. Sadly, the staid burghers of Swanage would have none of this, and donkey and horse-drawn carts remained the standard means of bringing stone down from the quarries to the Swanage quayside. All that was built was a short length of single track line connecting two sidings in a stone yard called ‘The Bankers’ to a double track section on the old pier. Halfway along the line a short branch ran into a fish processing building. Though this line has been out of use for nearly 80 years most of the rail is still in place, set in the promenade running from a terrace of houses called ‘The Parade’ up as far as the pier ticket office. At this stage, regular readers might be forgiven, for concluding that this post was intended for Tunnel Vision and has strayed into Behind The Water Tower by mistake. Patience, dear reader, patience; today’s rambling post will – in the manner of a BWH&AR train – eventually reach its rightful destination. Both Mowlem and Burt left their physical marks on Swanage, bringing redundant material from London such as cast iron bollards and even the frontage of the Town Hall. In a few days time I was about to learn about the quick witted action of two brave Poles whose actions during WWII prevented the Luftwaffe from leaving a different sort of mark the Isle of Wight! 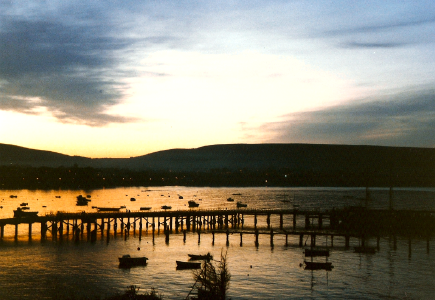 In 1992, Swanage Pier was dreadfully run down. It has since been beautifully restored thanks to a heroic restoration effort, led and funded by local residents – a project comparable in scale to the rebuilding of the Swanage Railway. At the time of my visit most of the pier was closed to visitors, part of the landward side was in use for car parking. Walking along the tramway as far as the pier, I spied a small blackboard that had once carried the notice Parking £1 inscribed in chalk. But that had been rubbed out it now said Henryk Rutkowski, Monday, 11.30am. What or who is the Henryk Rutkowski? I asked the car park attendant. That’s a Polish sailing ship, he replied, You can go for a trip on it if you like. Tickets are on sale in the Tourist Information Office. Arriving early at the Tourist information office first thing the following day I discovered that the Henryk Rutkowski was a small Polish square-rigged sailing ship which had sailed to Swanage to take part in the town’s Water Festival – an event designed to promote the town as a water sports venue. The first few trips that the Rutkowski was to make with holidaymakers were sold out but I managed to get four tickets for the Wednesday trip. Going for an evening walk along the downs, I heard Polish from a ship’s PA echo over The Downs, the Henryk Rutkowski has arrived. The old and new piers at Swanage. Photo Sylwia Talach. Wednesday arrived all to slowly. In the morning, Swanage celebrated the arrival of a new lifeboat, we looked forward to our afternoon trip on the Rutkowski. I apologised to the Bosman, the ship’s mate, who was checking tickets as we clambered on board. I explained that I only had four tickets, but one of my children has brought a friend. Nie ma problemu. I could see that it was going to be a good day. Perhaps, the highlight of the trip was when he invited one of us to hold the ship’s wheel for a photo opportunity and then seeing that my 14 year-old was doing such a good job, he left us briefly in charge while he chatted up some young ladies in the bows. Wednesday evening was a what Poles call an integracja event. Which is nothing to do with integral calculus, and everything to do with drinking lots of beer and making new friends. The venue was The Red Lion in Swanage High Street. Some members of Rutkowski’s crew sang sea shanties. I practised my skills as an interpreter. The children had their first lesson in playing pool, courtesy of some friendly locals. All to soon the holiday was over and it was time to return home, but not before I had conceived of a plan to return and hitch a lift on Rutkowski on the first leg of its journey to Poland, when it sailed from Swanage to Yarmouth in the Isle of Wight. I arrived in Swanage really early so as not to miss the boat. I need not have worried. The previous evening there had been a farewell integracja organised by the Swanage locals and the crew were still recovering. My new mate, the Bosman asked the Captain whether he was prepared to take on board an English hitchhiker, Nie ma problemu, and I was on board. During the journey I interviewed him and several members of his crew. On board was a famous Polish sea shanty band the Cztery Refy. In England, sea shanty bands play to a few bearded locals in the back of a pub; in Poland, the Refy had entertained thousands of youngsters at the big sea shanty festivals in Cracow and on the Mazury Lakes. Later on I wrote up my adventures in an article which subsequently appeared in the London-published Dziennik Polski. A Polish Grom class destroyer arrives in Scotland as part of the Peking Plan. Photo former Polish Government in Exile. The biggest surprise was still ahead of us. Arriving at the pier in Yarmouth we were told that we were invited to be guests that evening at special reception being organised by the Royal Solent Yacht Club. By now, I has become the ship’s ex officio interpreter so, as everybody seemed to expect it, I came along too. It’s perhaps a measure of the success of that evening that I remember very little about it! 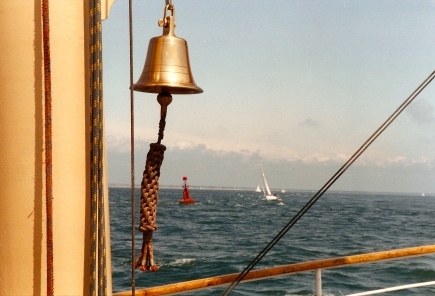 The following morning, as we took a number of Club members and their friends for a sail, I was told a most extraordinary story which explained the warmth of our reception. On 4 May 1942, Cowes on the Isle of Wight was bombed by the Luftwaffe who dropped 200 tons of bombs on the town. The Polish Grom class destroyer ‘Blyskawica‘ was being refitted at J Samuel White’s yard, where it had been built and launched 5 years earlier. Captain Wojciech Francki ordered the ‘Blyskawica’ to leave her moorings, and drop anchor outside the harbour. Here, 1st artllery officer, Lieutenant Commander Tadeusz Lesisz and his gunners retaliated all night with such vehemence that her red hot guns had to be doused with water, and more ammunition had to be ferried across from Portsmouth. But for the brave defence put up by the Poles, the human casualties and damage to the town would have been far worse. Tadeusz Lesisz, born in Kozienice, Poland on 10 July 1918, naval officer in the Polish Navy and the Royal Navy, architect, chairman of the Federation of Poles in Manchester, died on 23 September 2009.